As European Union negotiators can’t see any reason to support Brexit, they will continue to keep the European Union’s best interests in mind — which is to say, they will try to stop, slow, obfuscate, or otherwise derail the Brexit process by almost any means possible. And why shouldn’t they feel that way? The EU is a net beneficiary of £8.6 billion annually courtesy of the UK, so there’s little incentive to stop a contribution that is larger than that of all other EU-member countries except Germany. If there are any Brexit benefits to the European Union, nobody has bothered to tell EU negotiators or EU media channels. So how would anyone know if there will be Brexit benefits for the EU when the UK government hasn’t mentioned them once? And yet there are likely many Brexit benefits — for both sides — that just aren’t being discussed. When you’re trying to sell apples to a potential customer, giving them a nonstop spiel about how much *you* like apples won’t help you sell many apples! But if you hand your potential customer a hot glass of mulled apple cider and walk them past appealing displays of fresh apples, followed by a pleasant tour through the on-site bakery bursting with the aroma of piping hot apple pies and offer them a tantalizing sample at the exact moment their interest in apples is high, you’ll sell more apples. If you’re selling cars, you don’t spend your time telling the customer about the specifications of the car and how it can transport you here and there with ease. Any ol’ car can do that. Instead, you answer their questions about the car, you offer a test drive so they can experience how much better it drives, sounds, and looks than their present car, all of which work together to help them fall in love with the car you’re selling. If you’re a really smart salesperson, you’ll slap a dealer plate on the new car and let your customers take it home for the weekend so they can show it off to their comrades who will help convince them the new car is much better than their old jalopy. And have you ever noticed that beer commercials don’t show you endless cans of beer and a quick snapshot of the brewery? Breweries are highly experienced marketers and they want to show you good-looking people having a great time socializing with their friends and family in a picturesque setting or while engaged in enjoyable activities. Look at that product placement! There’s the can of beer right beside those sizzling steaks on the barbecue while those great people in the background are enjoying their evening. Considering a run to the beer store? Well yes you should — because you’re a good person, you work hard, you love spending quality time with your friends and family and you deserve a summer’s evening just like the people on that commercial. That’s the message. Marketing types call this Feature/Benefit selling, ‘Selling the sizzle, not the steak’ which isn’t about what the product or service actually is, it’s about what it can do for you and how it can make you look or feel happier and better. What Isn’t Theresa May Doing? She isn’t selling the benefits of Brexit to the EU. We know there are many benefits for Britons but even that has been under-sold. In the early days following the Leave referendum it might’ve looked to Remainers as though Brexit could still go either way, so Theresa May was probably wise to move cautiously at first. But that time has passed. Almost every person and business in Britain wants to get beyond the present period of uncertainty and get on with creating a fresh start for the UK outside the European Union. The right time to begin crafting a trade agreement that works even better than the present trading system has arrived. And now that we’re at this point in time, under-selling the benefits of Brexit to UK and EU citizens is not the way forward. Theresa May needs to put on her ‘Steve Jobs hat’ and figure out what the best possible Brexit vision looks like from both the UK and EU perspectives. Starting with a completely clean sheet; What would that look like in its entirety? What would it look like five years on? Once the vision has been considered by Theresa May, only then should it be communicated to her Cabinet, while the Department for Exiting the European Union (DExEU) should oversee all other UK ministries and departments as they compile reports that describe what their best-case scenario would look like in practical terms. Then it’s simply a matter of working to those ideals as much as is practicable to create a Vision Statement that can be released to the public, sans the excruciating detail required in government policy papers. ‘How do you like those apples?’ someone cheekily asked. Without equal weight given to each of those three factors any organization or project will ultimately fail. It can’t be emphasized enough; Endless discussion about the best Brexit from the UK standpoint are irrelevant to European Union citizens and businesses. Brexit must work for the EU too, or it will be increasingly uncomfortable and expensive for the UK as time rolls forward. Theresa May needs to find what things will work better for the EU in a post-Brexit world and promote those items on every visit to the EU. If there aren’t any Brexit positives for the EU, she better create some as they negotiate forward to a final trade and financial services agreement. Without an overarching vision even the best management and leadership will underperform. Perhaps severely. But as soon as May gives the order to each of her 25 Ministerial Departments and 20 non-Ministerial Departments to submit their best-case scenario (their best hopes and aspirations showing what their jurisdiction could look like five years on from Brexit) and from that she will be able to write a one page vision for each of the 45 departments. From there she will need to direct the Department for Exiting the European Union to create a list of items that could be seen as positives by EU governments, EU businesses and EU citizens. Those are the apples she needs to sell on every visit to the European Union. And then sell the ‘sizzle’ Theresa, not the steak. Theresa May must ‘create’ and ‘sell’ (Vision + Leadership + Management + Marketing) a Brexit that will benefit both the UK and the EU and begin to disseminate that better vision throughout both blocs. Throwing £40 billion at the EU now and (potentially) another £40 billion to obtain a trade and financial services agreement isn’t visionary — it’s ‘buying an agreement’ with taxpayer’s money — which is fine if that’s the only option. But it isn’t the only option. Getting citizens, businesses, and governments on both sides of the English Channel to buy-in to a grand vision that works even better than the present paradigm without it costing another £40 billion, must be Theresa May’s Number One Priority before the October 2018 Brexit deal-making deadline arrives. [P.S. to Michel Barnier, chief negotiator for the European Union] Jeez, Michel, for £40 billion shouldn’t the UK have received a bespoke customs deal, a bespoke trade deal, a bespoke financial services agreement *and* a chocolate mint on every UK pillow? As far as years go, UK Prime Minister Theresa May must be glad to see the end of 2017 as are many others in Britain and around the world. In matters Brexit, it was a year of low-level chaos and unfulfilled expectations — lots of ‘churn’ but not much actual progress. Yet the Prime Minister did make some exceptional speeches and unexpectedly reached-out to EU citizens to assure them that while Britain was leaving the European Union, it wasn’t leaving Europe. Well done on both counts, Theresa. She also told EU citizens living in the UK that their situation wouldn’t change, aside from having to register their residency with the Home Office and pay a nominal fee to retain their ‘settled status’. And while that didn’t seem to impress small numbers of EU negotiators, it brought great comfort to millions of expats living in Britain. Of course, it’s all contingent upon reaching a final ‘Withdrawal Agreement’ between the United Kingdom and the European Union, but it’s not too much of a stretch to suggest that the UK would act unilaterally to guarantee the rights of EU citizens working or studying in Britain in the case of no agreement. Theresa May also offered £40 billion of UK taxpayer money to the European Union; Everyone is unclear what this is for, as nobody from the government has bothered to explain it to citizens. Many people think that the UK’s share in the EU Parliament buildings and in other EU properties and assets should be sold off to the other EU27 members and the £9.65 billion (estimated) value could be used to pay future UK liabilities to the EU and that there is no need to pay £40 billion. Which seems reasonable. If there is an actual need for the UK to pay £40 billion to the EU, surely British taxpayers have the right to know what they’re paying for, and to whom. But if Theresa May has agreed to continue paying the £8.6 billion annual net payment to the European Union until Brexit completes within 2 years (approximately) plus 2 more years to cover the transition period, then that seems pretty reasonable too. If that’s how the £40 billion is being arrived at, there’s not much to complain about there. With all this reasonableness going ’round it’s no wonder that EU negotiators agreed to move to Phase II of the Brexit negotiations — trade — a hyper-important part of the post-Brexit relationship on both sides of the English Channel. Negotiating a mutually beneficial trade agreement between the UK and the EU in 2018 is Job Number One for negotiators on both sides. 44% of UK exports are sold to the EU27, making them Britain’s most important trade partner. 16% of EU exports are sold to the UK, making Britain the EU27’s most important trade partner. UK/EU Trade: Where do United Kingdom Exports Go? 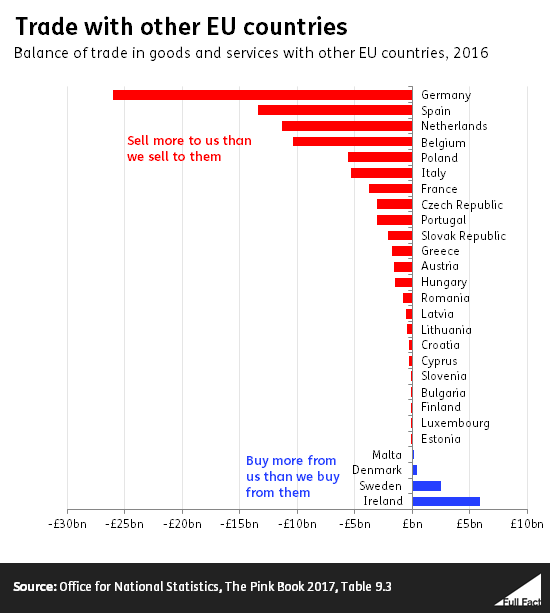 UK/EU Trade: Where do European Union Exports Go? Everything you want to know about the UK trade with the EU. Image courtesy of FullFact.org and the ONS. So There We Have It: They Can’t Live With Each Other, But They Can’t Live Without Each Other! Which is a very good thing. And because companies on both sides need to keep their biggest export market open and flourishing, there absolutely will be a reasonable trade deal — one that both sides can live with. There is simply no alternative. Which neatly explains the title of this blog post ‘Theresa May’s New Year of Hope’ because Job Number One for Brexit negotiators on both sides must be working a successful trade deal — and every CEO in Europe will be watching with keen interest, to put it very mildly. You don’t want to be the trade negotiator coming home without a deal and having to tell the CEO of Volkswagen or BP that you were too incompetent to get a deal. Yikes! There will be an excellent UK/EU trade deal in 2018, a trade accord that both sides will be rightly proud of — one that works for CEO’s, citizens and governments throughout Europe. As the focus will be on trade in 2018 (something that both sides must preserve if today’s politicians want to keep their jobs) the new year looks to be one of the better years for relations between the UK and the EU27. Let’s hope that Phase II of the Brexit negotiations move smartly along and that (if a Phase III is required) the momentum that gets built throughout 2018 works to facilitate friendly and workable solutions to any remaining issues between the two blocs. Politicians and negotiators on both sides of the Brexit divide have everything to gain by bringing home a fair and workable trading agreement and everything to lose if they don’t. Therefore, let 2018 be ‘The Year of Hope’ as 512 million European citizens are counting on their politicians and negotiators to open windows of opportunity as big as the sky, and to create even more justice and fairness for all Europeans, no matter where in Europe they may live, work, or play. No matter which side of Brexit you’re on, we at Letter to Britain wish you a Happy, Safe, and Prosperous New Year! Just as Theresa May’s government appeared to be on the brink of collapse, the European Commission President asked the British Prime Minister to meet him in Brussels to jointly announce that negotiators had achieved the breakthrough to move forward to Phase II of the Brexit process. EC President Jean-Claude Juncker said that “sufficient progress” had been made on Phase I discussions by December 8th, and the parties can now move on to matters of trade. Which is a great relief for some. For others, not so much. Member of the European Parliament (MEP) Nigel Farage is on record as being against anything other than a complete Brexit with only the timeline to be negotiated. Indeed, this is the position of many of the 17,410,742 people who voted for Brexit in the June 23, 2016 referendum that decided the United Kingdom’s future in, or out of, the European Union. And as negotiations drag on and as more political plays come to light courtesy of the ever-present media, the number of Britons who support Brexit are increasing, while those who supported it from the beginning want a faster, ‘harder’ and more complete Brexit. So, What Did Theresa May Agree To on Behalf of All UK Citizens? For now, nothing will change in the UK until Brexit day. The existing EU customs and trade union will continue to be in effect and the European Court of Justice (ECJ) remains the top court for the entire European Union, including the UK. It’s also been reported that the ECJ will continue to be the court that rules over EU citizens living, working or studying in the UK for up to 8 years after Brexit — thereby giving European Union expats full access to the British court system — but also full recourse to the ECJ. Essentially, EU citizens living in the UK will enjoy the protection of two court systems, while UK citizens will have the protection of only one court system. Further, Theresa May has agreed that from December 8, 2017 until Brexit completes (whenever that is) the UK will abide by all laws and regulations passed by the European Parliament, the European Commission, and that the UK will accept European Court of Justice rulings. The final Brexit date has been suggested as March 29, 2019 but at this stage anything could happen including the government bodging the job and not getting voters their Brexit for another decade. Goodness knows what kind of legislation the EU could pass during that time, yet the United Kingdom would be obligated to follow both the spirit and letter of that legislation. And EU citizens living in the UK would have more rights than UK citizens due to the ECJ deal. Let’s hope they don’t send an extra 5 million migrants to Britain annually (for example) as the UK would be obligated to accept them under the terms of this agreement. If breaking the UK Treasury and maybe breaking the country is the goal of the EU (or if it ever ‘becomes that’ due to new politicians coming to power in the EU/EC) that’s surely the way to accomplish it. Certainly, the United Kingdom is in a precarious position from now until the day Brexit occurs. Finally, there will be no transition period for Gibraltar. Did I forget to mention that? Yes, they did too at their joint press conference, until a reporter asked about it. Now the UK is obligated to pay £39 billion to the EU, and will continue to pay £8.6 billion (net) to the European Union budget until such times as the UK is no longer a member of the union. Nobody has really said what the £39 billion is for — other than to say it covers the UK’s future obligations to the EU (which, reliable sources have said should only amount to £6.15 billion) and let’s keep in mind that the United Kingdom remains part-owner of many EC and EU buildings and properties — including the Parliament buildings in Brussels, Strasbourg and Luxembourg, and Britain’s share in the value of those and other EC/EU holdings exceed £9.65 billion. Thus far, it sounds like a pretty one-sided deal in the EU’s favour — and many are now calling Prime Minister May ‘Theresa the Appeaser‘ after former British Prime Minister Neville Chamberlain who tried to ‘appease’ Adolf Hitler and his Nazis prior to Britain’s entry into WWII — for which he was unceremoniously booted from the Prime Minister’s chair never to return. Others have called the deal a ‘sell-out’ of British interests, while other groups claim that Theresa May (an admitted Remainer) is trying to scupper the deal by using the high cost of Brexit to get more Britons over to the Remain side. What if it’s true that this deal is merely the deal that the UK will be forced to honour if UK and EU negotiators can’t arrive at a better deal that supersedes this deal? There is real incentive for Theresa May and her Conservative Party to excel here because it is 100% certain they will lose the next election if this deal isn’t replaced by a better deal prior to March 29, 2019. Prime Minister May will thereby have almost as much power as a wartime Prime Minister to get a better deal done, and that’s as good a way as any to move things along. What if she now spends a year trying to negotiate a better deal knowing that at worst the present agreement is the worst that can possibly happen? A little brilliant, I’d say. And in the meantime, the worst-case scenario is survivable by her country but unsurvivable by her party if they want to win the next election. In the simplest terms, if Theresa May’s Conservative Party don’t fully cooperate with her to gain a better Brexit deal, they will by default, have handed the reins of power to Labour’s Jeremy Corbyn. Which means that the Prime Minister with her party helping, must find a way to improve on the present deal and they have one year to make it happen. As one Machiavellian to another; Nice touch, Theresa. Prime Minister Theresa May in the House of Commons on December 11, 2017 where she comments on the December 8th Phase I agreement with the EU.